The public comment period is July 30, 2012 to August 30th, 2012. 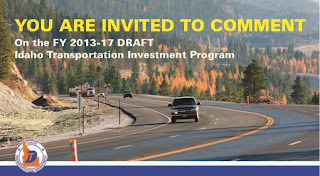 You can email your comments to comments@itd.idaho.gov or send them via mail to: ITD - ITIP Comment, Attn: Adam Rush, P.O. Box 7129, Boise, ID 83707-1129. 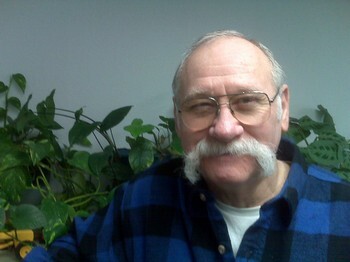 For CD's or paper copies, please contact Adam Rush at (208) 334-8119 or the general email at comments@itd.idaho.gov. 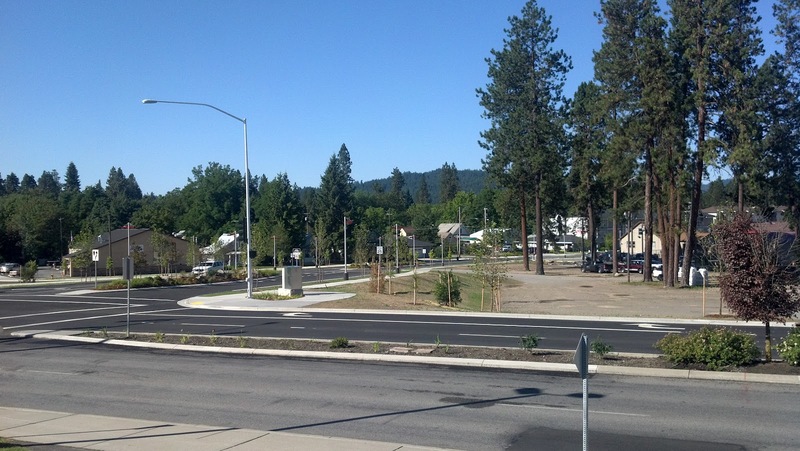 It looks like Greensferry overpass in the city of Post Falls, Idaho could become a reality in the next two years. Greensferry Road is between the Seltice Way overpass and Highway 41. 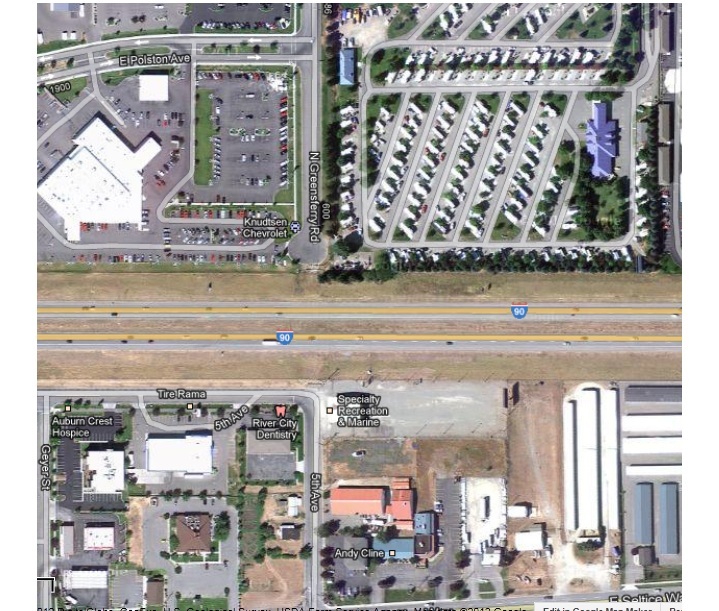 The overpass location would be on Greensferry Rd intersecting I-90. "Greensferry looks really promising now, sooner rather than later" Post Falls Mayor Clay Larkin in a statement to the Coeur d'Alene Press. "I can see if we get all the wrinkles ironed out starting construction in a year or so." The overpass would improve traffic and pedestrian circulation and emergency response and provide another much-needed connection between the north side of Post Falls and the south side. Funding issues still have to be worked out, but it looks as though the Greensferry overpass could come to fruition sooner than expected. River Avenue & Northwest Blvd. 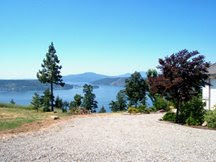 River Avenue was just completed in the City of Coeur d'Alene. River Avenue ties the college district routes together along with a new signal that was installed at the intersection of Northwest Boulevard and River Avenue. 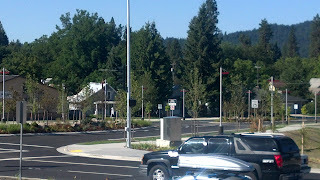 This is the second of the recent improvements along Northwest Boulevard, in the City of Coeur d'Alene. 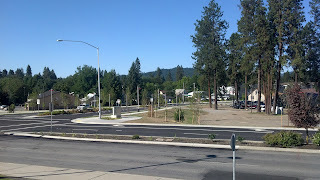 Hubbard Avenue was completed just prior to the River Avenue intersection. 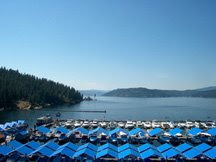 Great job city of Coeur d'Alene!!!!! MPO - Metropolitan Planning Organization ??? A metropolitan planning organization (MPO) is a federally mandated and federally funded transportation policy-making organization in the United States that is made up of representatives from local government and governmental transportation authorities. The United States Congress passed the Federal-Aid Highway Act of 1962, which required the formation of an MPO for any urbanized area (UZA) with a population greater than 50,000. 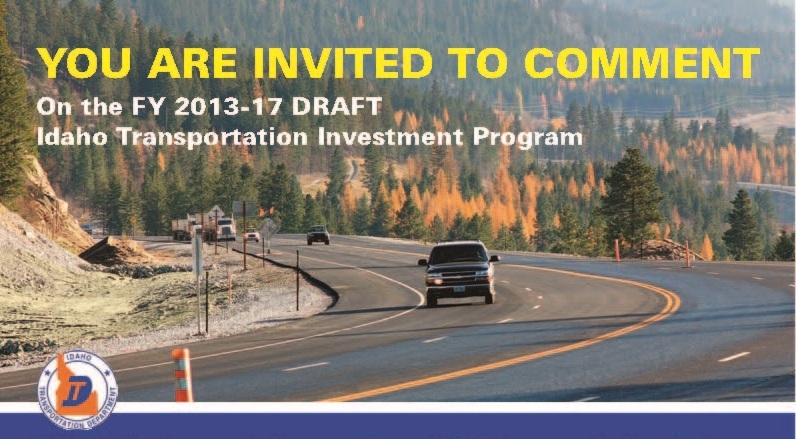 Federal funding for transportation projects and programs are channeled through this planning process. Congress created MPOs in order to ensure that existing and future expenditures of governmental funds for transportation projects and programs are based on a continuing, cooperative, and comprehensive (“3-C”) planning process. Statewide and metropolitan transportation planning processes are governed by federal law (23 U.S.C. §§ 134–135). Transparency through public access to participation in the planning process and electronic publication of plans now is required by federal law. As of 2005, there are 385 MPOs in the U.S.
protect air quality: transportation plans, programs, and projects must conform with the air quality plan, known as the “state implementation plan” (SIP), for the state within which the UZA lies. Presently, most MPOs have no authority to raise revenues such as to levy taxes on their own, rather, they are designed to allow local officials to decide collaboratively how to spend available federal and other governmental transportation funds in their urbanized areas. The funding for the operations of an MPO comes from a combination of federal transportation funds and required matching funds from state and local governments. If you would like to know more, visit the link to Wikipedia's site. 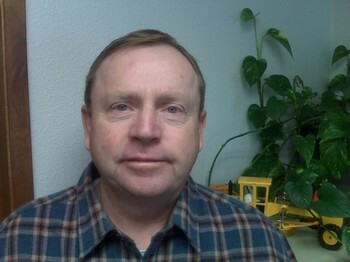 At the regular scheduled Board Meeting of the Lakes Highway District (LHD) held on July 2, 2012, the Board of Commissioners unanimously appointed Commissioner Rodney A. Twete as the new LHD representative to the KMPO board with commissioner Weston E. "Monty" Montgomery appointed as the alternate. Looking for a Job? Want to be a Bike Boss in Salt Lake, UT? This story came across in Today's News and the title caught my attention. Hiring a "BIKE BOSS" in Salt Lake City, Utah. 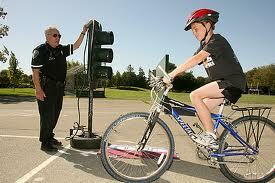 Your job would be to make bicycling conditions safer. The position pays $38,000 a year and the official job title is a Public Works Bicycle Coordinator. In the article, Councilman Arlyn Bradshaw commented on the Council's decision to fund and allocate the position saying "Its a public safety issue" and noted that 66 auto-bicycle accidents occurred in 2011 in the area served by the Unified Police District. With so many people still out of work and the story being transportation related, I thought it worthwhile to post. TransitPlus Transportation Plan Update Draft FinalKMPO's Transportation Plan Update consultant, Suzanne O'Neill of TransitPlus, Inc., released the Transportation Plan Update Draft Final dated July 3, 2012. If you have any comments or questions regarding the updated Transportation Plan, please email us at kmpo@kmpo.net. 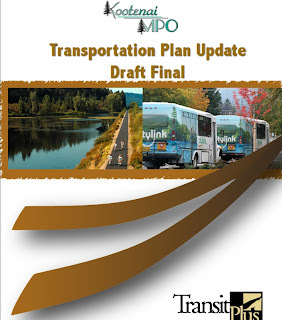 to view the Transportation Plan Update Draft Final, under News and Notices dated July 3, 2012. Congress has passed a 26 month surface transportation bill last Friday that runs through September 30, 2014. The transportation bill is 599 pages long and contains a 91 page summary. More detailed analysis will be coming out over the coming weeks. The bill will make some stakeholders happy and others not so much, but the bill does have a number of provisions that modernize federal transportation policy and set the stage for more visionary advancements in the next bill. Congress is conducting an in-state work period this week and is in legislative recess. 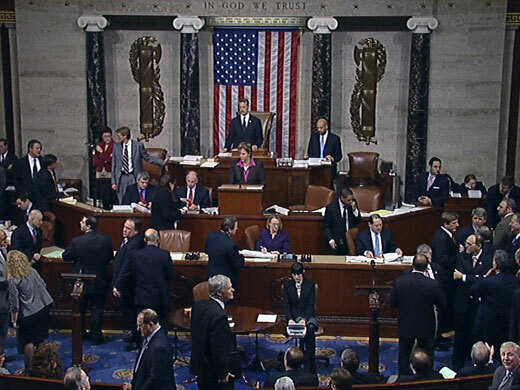 The House also passed a fiscal year 2013 transportation spending bill. 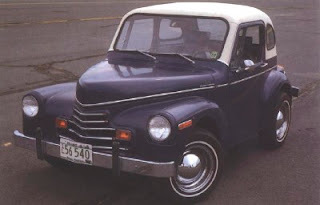 A little bit more of Post Falls, Idaho's history in car manufacturing. I posted a story earlier about the Stinebaugh Leata Cabalero. 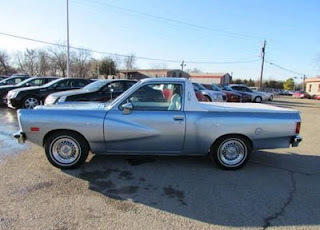 Since the original post, I found out there was an earlier version of the Leata Cabalero manufactured by Sonny Stinebaugh in Post Falls, Idaho. Below, is a picture of the original car manufactured at Stinebaugh Manufacturing along with a link to the http://auto.howstuffworks.com/1975-leata.htm website that posted the story. Thank goodness for the internet and all of the stories published. They manufactured a few different models over the years. Stinebaugh's brochure stated "The Cabalero owner knows he is one of a few people fortunate to experience the pleasure of a truly exceptional automobile meant to be a landmark in automotive history." It's interesting that some of these cars are still around and sought after and at a fair price years later. I thought it might be worthwhile. I know it's expanded my car knowledge.